Faculty & StaffRobert H. Magruder, Ph.D.Kimberlee Entsminger, Ph.D.Davon W. Ferrara, Ph.D.Danielle Garrett, Ph.D.Duane Hatch, Ph.D.Scott Hawley, Ph.D.Krista McBride, Ph.D.Alison B. Parker, Ph.D.Rachel Rigsby, Ph.D.Steve Robinson, Ph.D.Justin Stace, Ph.D.Libby Severson, B.A. 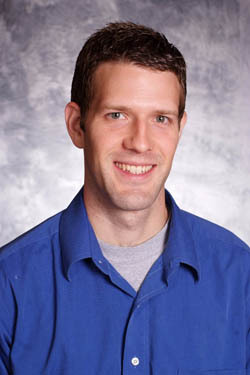 Steve Robinson joined the Chemistry and Physics department in the fall of 2007 after receiving his Ph.D. in Electrical and Computer Engineering from the University of Illinois at Urbana-Champaign. Previously, he received an M.S. degree in Electrical Engineering from Illinois in 2003 and B.S. degrees in Electrical Engineering and Computer Engineering from North Carolina State University in 2000. His doctoral research focused on the study of low-temperature, low-dimensional electronic systems, specifically with regard to carrier transport in silicon-based phosphorous and gallium nanowires. Steve is married, has three children and enjoys hiking, playing the drums, and theology. I would like to contact Dr. Robinson.